Joining any branch of service should not be a decision made on a whim. There are many things to consider such as what type of training you want to receive, or opportunities for advancement and further education. Where do you want to live? Do you prefer land over the sea? There are many other quality of life issues you should consider, so do not just sign up without seriously learning about your future career. Whether you are wanting to just spend 4 years to help pay for college or you want to make it a career for 20 plus years, the same amount of consideration should occur for you to get the most of your decision to serve your country. The Navy was officially established by the Continental Congress in 1775. The Navy's primary mission is to maintain the freedom of the seas or as the slogan goes, "A Global Force for Good." The Navy makes it possible for the United States to use the seas where and when national interests require it. In addition, in times of conflict, the Navy helps to supplement Air Force air power. Navy aircraft carriers can often deploy to areas where fixed runways are impossible. An aircraft carrier usually carries about 80 aircraft. Most of these are fighters or fighter-bombers. Additionally, Navy ships can attack land targets from miles away (with very heavy guns), and cruise missiles. And, the Navy is also primarily responsible for transporting Marines to areas of conflict. If you have an interest in sailing boats, flying airplanes, driving in submarines, communicating with all the above, maintaining such equipment, or even special operations that include diving, swimming, jumping out of planes and mastering small arms weapons, explosives, and land warfare, the Navy will probably have a job that is a fit for you. 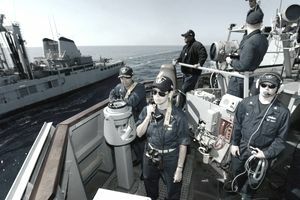 The active duty Navy has more than 300,000 active duty officers and enlisted Sailors. All enlisted sailors on active duty (and in any branch of the military) are eligible for the G.I. Bill. In addition, the Navy offers a college fund for recruits who enlist in jobs the Navy considers understaffed, adding money to monthly G.I. Bill entitlements. The Navy also gives tuition assistance for college courses taken off duty. Choosing a military service can be a complicated decision. The services differ when it comes to enlistment incentives, assignment opportunities, quality of life programs, deployment rates, promotion opportunities, and more. There are a few different routes to becoming an officer in the Navy. You can enroll in the United States Naval Academy (USNA), with a nomination from a member of the executive or legislative branches of government. You'll first enroll in Naval Academy Prep School in Newport, R.I., where you'll receive instruction and prep for the training and curriculum at the USNA. You also can become an officer either by going through the Navy's BOOST program, the Enlisted Commissioning Program, or the Chief Warrant Officer program. There's also Navy ROTC as an option.